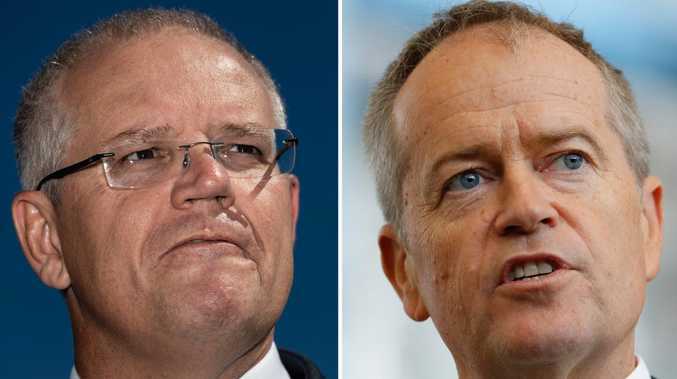 "We are favouring the theory of an accident," he said, adding 50 people were working on a "long" and "complex" probe into what caused the blaze. He said they would be interviewing workers from five companies who had been hired to work on renovations to the cathedral's roof, which was where the fire is thought to have started. "This is unacceptable, one of the most historic cathedrals in human history burning to the ground, a landmark, an icon," wrote one user. "I can only hope that the immolation was natural because if it is found that the blaze was caused by some idiot it'll be disgusting beyond belief." Another added: "This is unacceptable. Whoever caused this deserves to rot." "In case it truly was an accident that caused the fire, we should pray for the person who made the mistake that started it all," read one post. "Can you imagine being the guy who accidentally burned down Notre Dame and how horrific that would be? He's going to need prayers. Lots of them." "Many of these restorers were interviewed overnight," said a source close to the investigation that has been opened into "accidental destruction by fire". "The fear is that a small fire began in the rood where they were working, and quickly spread across the building. "The irony is that the restorers had just begun working on the spire which collapsed along with much of the roof." It has emerged Julien Le Bras, the boss of Le Bras Freres, boasted about his firm's expertise in dealing with historic buildings. In a video posted online when the 32-year-old Le Bras said: "We are proud of our work on historic buildings. "We have the technical ability and the competence for his work. Our first thought is to protect the values of historical buildings, it's in our DNA." 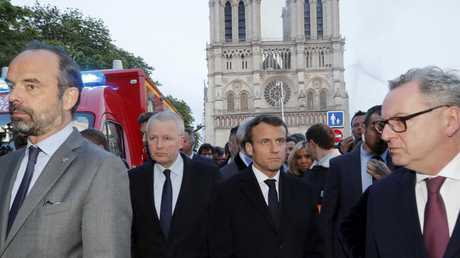 France's President Emmanuel Macron has addressed the nation in a televised speech and vowed to make the cathedral of Notre Dame "even more beautiful". Mr Macron told viewers he shared the country's sorrow and hope for the future and reiterated that the structure would be rebuilt. 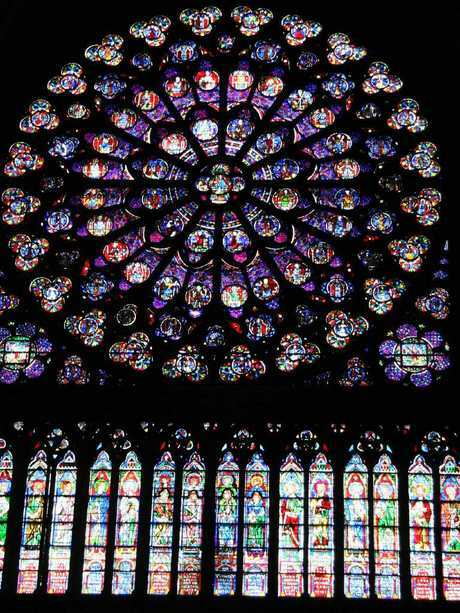 "We will make the Cathedral of Notre Dame even more beautiful within five years. We can do this," he said. But according to head of the group of companies for the Restoration of Historic Monuments, Frédéric Létoffé, it will take between "10 to 15 years" to fully restore Notre Dame. "This will require a lot of work since, beyond shoring and reinforcement, it will be necessary to build a scaffolding with an umbrella to be able to cover the entire roof that went missing, to ensure protection against weathering" he said. "I can only hope that the immolation was natural because if it is found that the blaze was caused by some idiot it'll be disgusting beyond belief," one user wrote. Another was more sympathetic. "Can you imagine being the guy who accidentally burned down Notre Dame and how horrific that would be? He's going to need prayers. Lots of them. Mr Macron previously warned the fire could continue burning for days, warning"the battle is not yet totally won". The 12th-century cathedral is home to incalculable works of art and is one of the world's most famous tourist attractions. Many of its religious artefacts - including a crown of thorns believed to have been worn by Jesus Christ - are said to have been preserved by brave firefighters who risked their lives to recover them. The cause of the blaze was not known, but the Paris fire brigade said the fire was "potentially linked" to a six million euro ($9.48 million) renovation project on the church's spire, and its 250 tons of lead. 7.53 PM: As horrified onlookers watch on, the cathedral's tallest spire collapses. 11.42 PM: Mr Macron declares, "We will rebuild Notre Dame", in a televised address, and says the "the worst has been avoided" but warns the fire could go on for "several days". 12:05 AM: Prosecutors' initial investigations suggest the fire started accidentally, ruling out fears of arson or terror links. 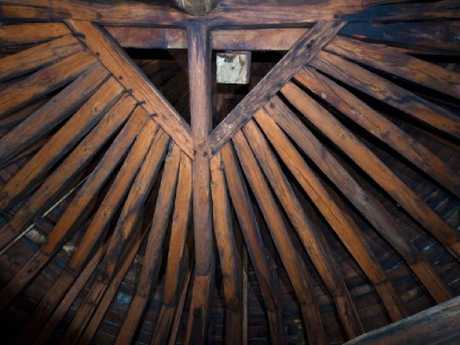 Wooden latticework inside the 12th-century cathedral is said to have been fuel for the destructive fire. A spokesman for Notre Dame told reporters on the ground that the flames were consuming the historic woodwork, which dates back hundreds of years and has a rich history. 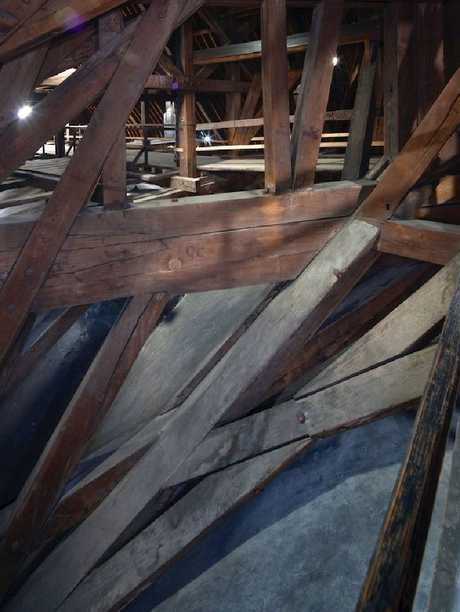 The wooden framework is primarily oak and dates back to the original framework first built for the cathedral. The trees used for Notre Dame's frame were cut between 1160 and 1170, and make up the oldest parts of the structure. The beams used were old growth - about 300-400 years old - so they were tall enough for the buildings high, vaulted ceilings. 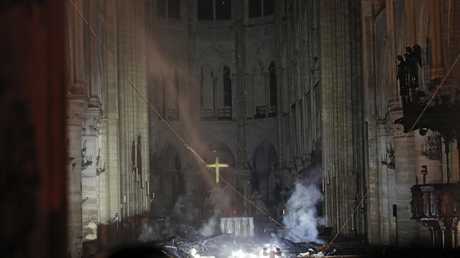 The framework in place at the time of the fire dated back to the year 1220, according to the Notre Dame website. The internal "forest" structure was so named "because of the large number of beams that had to be used to set it up, each beam coming from a different tree", which was harvested from a nearby wooded area. 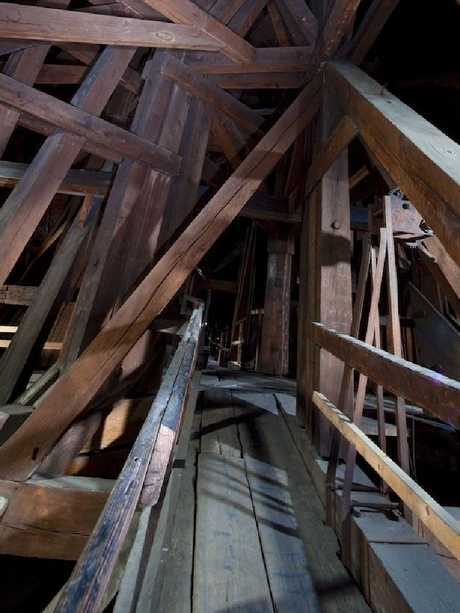 It's estimated the workers felled 13,000 trees to make up the internal latticework, with the strong oak beams holding up a roof of heavy lead tiles. The site notes that the original internal forest of woodwork in the choir section has been replaced, suggesting it may have previously been destroyed by a fire. The historical oak interior is suspected to have fuelled the destructive fire. The interior latticework of Notre Dame is affectionately dubbed 'the forest'. 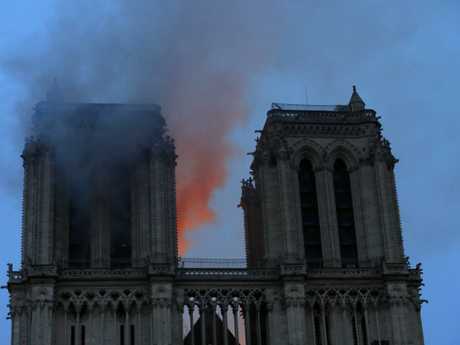 He said the cathedral's roof could not be rebuilt exactly as it was before the fire because "we don't, at the moment, have trees on our territory of the size that were cut in the 13th century." He said the restoration work would have to use new technologies to rebuild the roof. The oak beams are said to be completely destroyed. A series of 76 four-metre tall paintings depict the New Testament's Acts of the Apostles, including the crucifixion of St. Peter and the conversion of St Paul. These paintings date from 1630 to 1707 and were created by members of the Royal Academy of Painting and Sculpture. Local firefighters formed a "human chain" to save these relics, entering the Gothic building to rescue treasures including the crown of thorns and the tunic of Saint Louis. Is there anything firefighters could have done to control the blaze that tore through Paris' historic cathedral sooner? "Very often, when you're confronted with something like this, there's not much you can do," said Glenn Corbett, a professor of fire science at John Jay College. Fire hoses looked overmatched - more like gardening equipment than firefighting apparatus - as flames raged across the cathedral's wooden roof and burned bright orange for hours. The fire toppled a 91-metre spire and launched baseball-sized embers into the air. While the cause remains under investigation, authorities said the cathedral's structure - including its landmark rectangular towers - had been saved. Some factors that made Notre Dame a must-see for visitors to Paris - its age, sweeping size and French Gothic design featuring masonry walls and tree trunk-sized wooden beams - also made it a tinderbox and a difficult place to fight a fire, said US Fire Administrator Keith Bryant. With a building like that, it's nearly impossible for firefighters to attack a fire from within. Instead, they have to be more defensive "and try to control the fire from the exterior," said Mr Bryant, a former Oklahoma fire chief and past president of the International Association of Fire Chiefs. "When a fire gets that well-involved, it's very difficult to put enough water on it to cool it, to bring it under control," Mr Bryant said. And while there's a lot of water right next door at the Seine River, getting it to the right place is the problem, he said. "There are just not enough resources in terms of fire apparatus, hoses to get that much water on a fire that's that large." Paris's narrow streets make it difficult to manoeuvre large ladder fire trucks, so European fire departments don't tend to have ladders as big as those in the United States, he said. St Patrick's Cathedral in New York City, built in 1878, installed a sprinkler-like system during recent renovations and coated its wooden roof with fire retardant. The cathedral also has at least four fire inspections a year. Washington National Cathedral - built in 1912 with steel, brick and limestone materials that put it at less risk of a fast-moving fire - is installing sprinklers as part of a renovation spurred by damage from a 2011 earthquake. It holds fire inspections every two years, but DC firefighters visit more often to learn about the church's unique architecture and lingo - so they'll know where to go if there's a fire in the nave, or main area of the church, for instance. "Just as the cross didn't have the last word, neither - for people of faith in France - will this fire have the last word," he said.